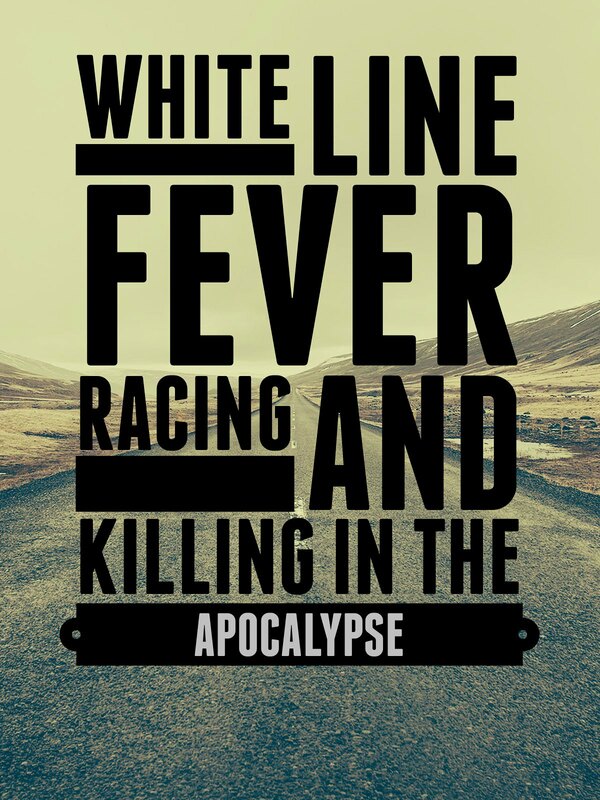 White Line Fever ver 2.8.1 Automobile combat in a post-apocalyptic future! (new Ver 2.8.1) renamed “White Line Fever” also: Handout Trifold. Hi! 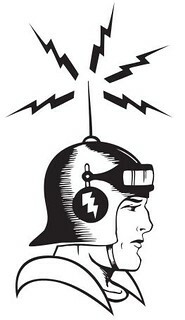 I’m a big fan of e-readers, tablets and the virtual explosion in digital content in the last five years. One area that seems to have lagged behind regular books is game rules. I’m a fan of smaller scope, easy to grasp miniature games that I can run just using my trusty Ipad or Android tablet. Trust me, I’ve done it quite a few times. The only paper we needed were unit or character sheets, most of the time. Perhaps a double sided cheat sheet of some kind, as well. So what’s available as a digital document? There are a few commercial alternatives out there at present– mostly delivered in the PDF format, so the publisher can retain control over the layout and quality of the document. I have bought a few, and I’m going to list the ones that I find in the commercial section below. I have no quibbles with reading PDF files on the tablet, in general. I do find them a lot harder to read (because of layout and type size) and harder to search and bookmark. When you are running a game, you’ll discover that the ability to rapidly bounce back and forth in the game is a must– therefore a hyperlinked Table of Contents or Index is a must. My preference is for EPUB or MOBI format for this reason. Epub is a “generic” standard for digital documents that will work on MOST tablets, including Kindles and Nooks. MOBI format works on Kindles and any device that runs a Kindle Reader, which is just about everything. Nooks purport to run only EPUB and PDF, but there have been some digital rights issues with them. It’s mostly an app issue– if you have the reader app on your device, you’ll probably be able to read it. So what’s this page all about? Well, I’ve been attempting to learn the EPUB and MOBI standards, just out of curiosity. Using SIGIL, a free epub editor, I’ve found older rule sets that have been on the web for several years, for free distribution, and have converted them to EPUB format, also for free. They are available for download, below. I’ve not asked for permission, based on the assumption that the original author intended to distribute the rules via the net, and this effort is another way to do that. If a rules author has an issue with something being turned into a digital format, I’ll pull it off this site. The following rules are found on the web as freely distributable files, usually with permission of the original author. ROAD WARRIOR/WHITE LINE FEVER is a fun little game of automobile to automobile combat in a post-apocalyptic future. Designed to be played with modified Matchbox and Hot Wheels cars! Just to alleviate a little of the confusion, I’ve added a Quick Reference fold out you can print out and distro to players as well. 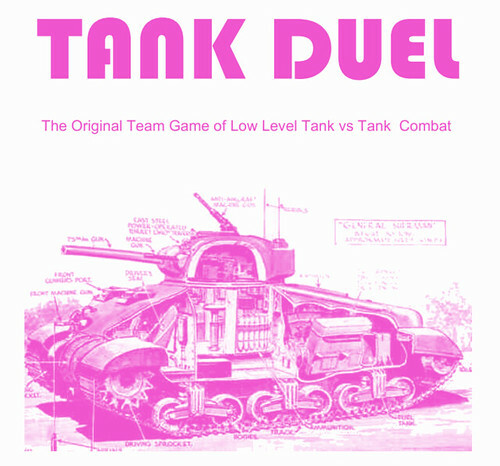 TANK DUEL is a great TEAM based double blind armor game based on World War 2 tanks. A team of players assume the roles of a single tank’s Commander, Gunner, Loader and Driver, and the game proceeds at high speed with very quirky (and easy) mechanics. I like it! 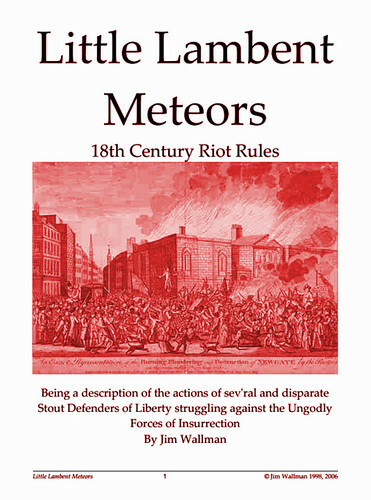 Written by Jim Wallman, who wrote Little Lambent Meteors. 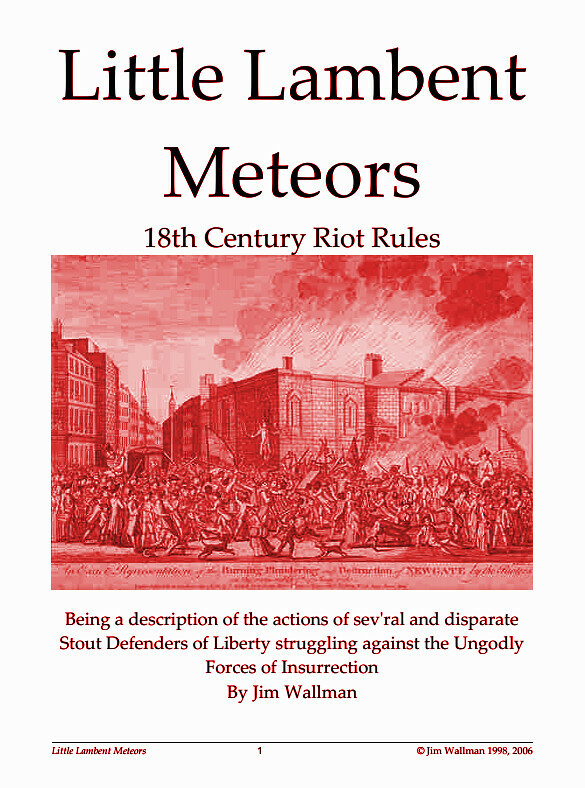 LITTLE LAMBENT METEORS, a simple game of rioting in (mostly) 18th Century London but the mechanics would work for many periods. Very amusing! As always, click on the cover to download the EPUB File. This game is available free of charge in many locations, I have not changed the text one jot nor am I charging for it, I have only changed the format to EPUB using SIGIL. 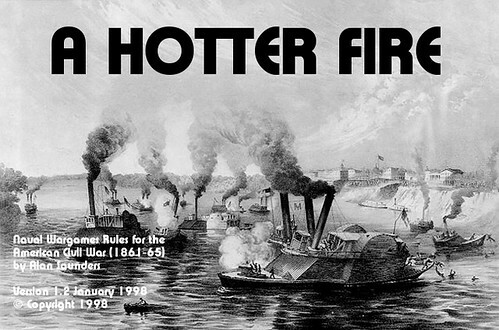 A HOTTER FIRE, a simple game of Ironclad combat in the American Civil War. By Alan Saunders and the Staines Wargame group. 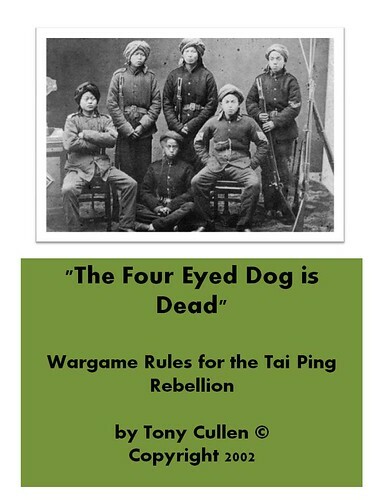 The FOUR EYED DOG IS DEAD is a rule set for fighting the Taiping rebellion in 19th Century China, by Tony Cullen, also on the Staines Wargaming Group page. Note: Four Eyed Dog has a Quick Reference Sheet HERE as a separate file and a set of Order Counters on the source page. Since these are “print once and done” files designed to be printed out, I didn’t jam them into an Epub, where they would be somewhat useless. 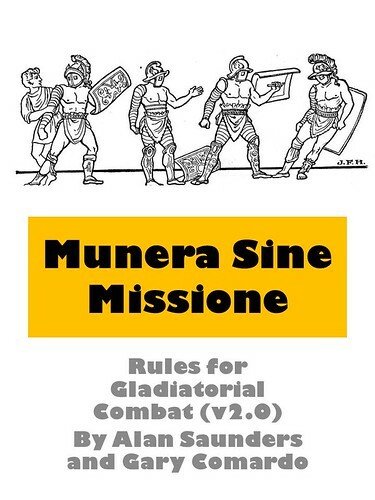 Here’s MUNERA SINE MISSIONE, one of my favorite simple gladiator sets by Mr. Alan Saunders of Stronghold & Staines Wargame Group fame. I like his work. Click picture above to download Munera rules in Epub format. Click on picture above to download Ty Beard’s A FISTFUL OF TRIPODS in Epub format. 2/19/2014 update: Way back in the early 70s, TSR (the Dungeons and Dragons people) were putting out lots of wargames (remember that?) 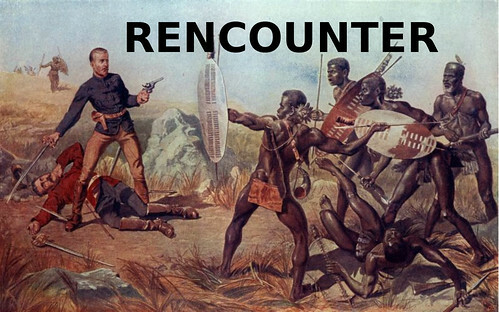 and genre games other than D&D, including Napoleonic and ACW rules. 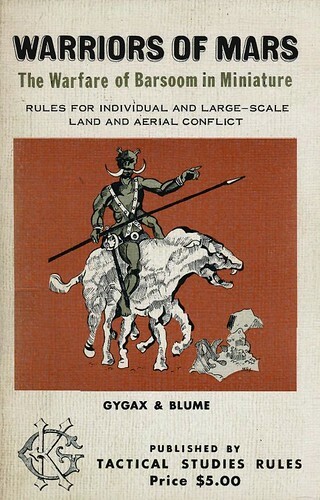 One of their early properties was WARRIORS OF MARS, which is kind of a cross between a giant campaign book, a source book, a dumbed down RPG, and most especially a book of Skirmish rules. As near as I can tell, the original authors are pushing a RPG-like game when they discuss the 1:1 scale game and a larger tactical game otherwise. This epub is pretty dense– and was time-consuming to create, as it had lots of little tables here and there, many of them reconstructed in XML to make for an easier read, but the tables in the appendices I just made graphics of, as they were too densely printed to HTMLize. Enjoy! this was a labor love to do. 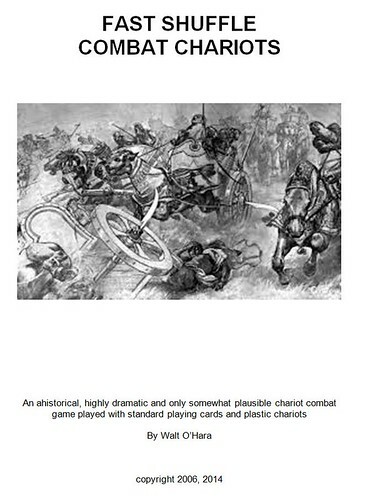 Click on the cover picture (ab0ve) to get your own copy of Fast Shuffle Combat Chariots in EPUB format. The CHARGE PIKES! 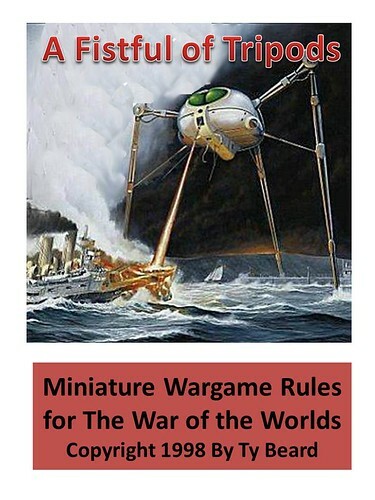 rules I found via Freewargamesrules and Miniature Wargaming page. 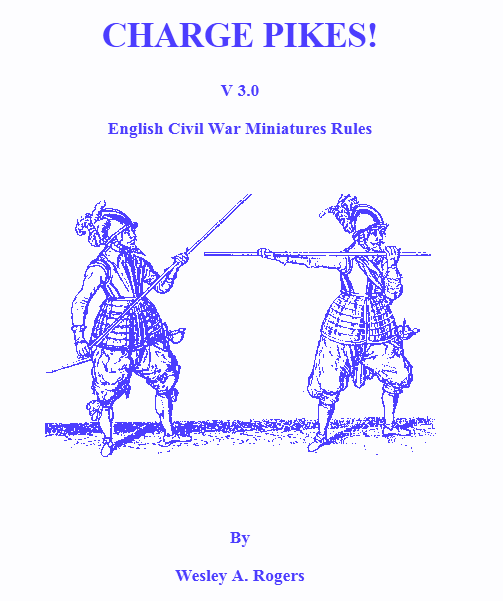 I had a hankering to create an Epub from a classic Musket and Pike set of rules. Charge Pikes is probably more technical than some of the choices provided here but nothing that will give Clausewitz a headache. I like this era and have been considering buying some miniatures for it– I could easily see running a game using an Ipad. Note, there WAS a playsheet (PDF) style that I need to figure out how to make from the original– it was available on Wesly Rogers’ old Angelfire site but that is sadly defunct. If I install the right drivers on my machine so I can distill the playsheet pages and print them as a separate PDF off of the main PDF. Look for the link when it gets done. To get the EPUB, click HERE. 25 Aug UPDATE: I’ve managed to extract the last two pages of the old PDF which make up the Playsheets. HERE THEY ARE as a double-sided PDF. You would want to print these out on paper for your players– they are pretty useless in EPUB format. The EPUB files above were created by me in SIGIL and are free for the download (see disclaimers below). Enjoy! Let me know how these work out for you. I plan on converting more. 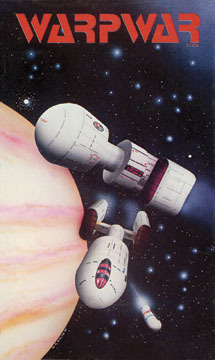 I’m likely to create epub files for my own THE MAGI and BIG DANGED BOATS. Possible future projects will be VIKING LOOTERS, my new man to man Nappy game, and maybe some decent civil war land battle rules. Suggestions welcomed– the criteria being they shouldn’t be too complex, have too many tables and pages and are light on the illustrations. An example from A HOTTER FIRE, being read in IBooks, on an IPad Air tablet. Pagination isn’t 100% perfect! The file is readable and if care is taken with the table of contents, fairly easy to navigate. DISCLAIMER. I did the best I could with what I had, but some of the times, a table will carry over to the next page or the pagination isn’t 100% clean. I’m not responsible for the consequences of loading epubs on your tablet. Use at your own risk. Check your tablet’s instructions for how to load an epub file. A set of rules is on this page if it is A) older than five years and assumed to be distributed freely, either expressly stated or by permission of the author and B) found distributed for free, ostensibly with the creator’s permission OR C) has a form of Creative Commons license that implicitly grants permission to redistribute without me having to contact the creator directly. Intellectual property rights are assumed to be owned by the creator and any objections from that party on thes grounds of clear ownership will result in the epub being deleted from the library. Do NOT send me material to host on this library as epubs– most especially from active commercial companies that you want to see epubs from. That’s really not my call. Besides, I have a multiplicity of targets already, Thank you. I found a number of older digital rules (mostly in PDF format) here and there on websites that appear legit. 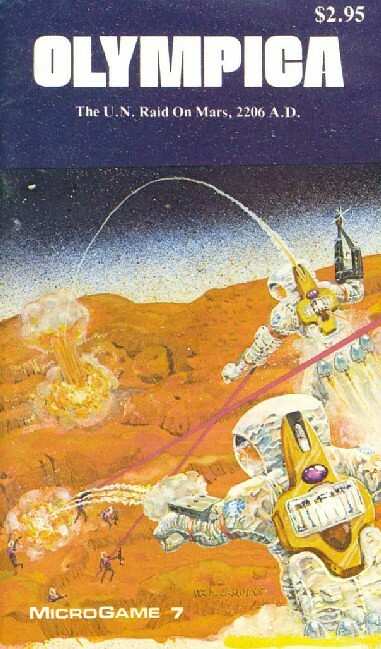 I’ll start with a recent discovery– WARRIORS OF MARS, an 30 years old TSR miniature wargame rulebook set in the Barsoom of the Edgar Rice Burroughs novels. Some helpful soul loaded this up to archive.org, so I’m assuming they had some express permission to do so, or the original publisher has zero interest in republishing it. 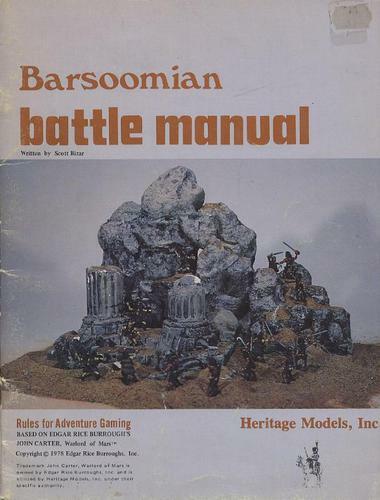 I also found a very poor PDF copy of the BARSOOMIAN BATTLE MANUAL, by Scott Bizar, which was clearly made from a bad scan. It’s too much effort to convert to EPUB, but I did clean up the PDF a little, going from double paged to single paged layout, which is at least readable. As far as rules go, it’s good color text for the period, but I’m not unduly impressed with either of these designs. There’s no denying the nostalgic appeal, of course. 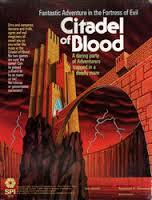 3/9/2014 Update: Added Melee by the Fantasy Trip and WarpWar from Metagaming as Epubs. 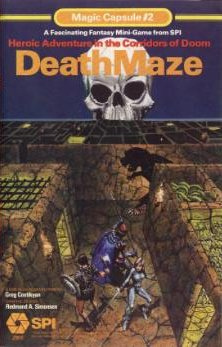 A great RPG/Skirmish and a great diceless Space Combat game from the dawn of the gaming industry. Ancients has been removed at the request of One Small Step, Inc. Sorry, everyone. I don’t suppose it’s any great secret that THE place to start is THE WARGAME VAULT, which will sell you exactly what’s in this category: Digital Wargame Rules. Be aware that by far and away, this is primarily a source for PDF files. With that said, the service is excellent and the selection is eclectic. The prices are very competitive with higher end markets like Amazon, etc. I picked up Gruntz 15mm SF Skirmish rules there, Roman Seas, Victory at Sea, Leviathans material and Cosmic Patrol from Wargame Vault, plus many assorted supplements and RPG series stuff. One great thing about the Vault is they don’t mind carrying free (zero cost) items along with the commercial stuff, so spending some time poking around the collections on there is time well spent. I’ve not found any EPUB or MOBI material to speak of, so keep that in mind. I like that Wargame Downloads carries a wider range of products than the Vault, and also they carry a lot of very low-priced and entry level stuff. They seem to have more diverse format types available as well, but I haven’t really studied it. Osprey Publishing is starting to release their smaller, blue cover wargame rules on obscure subjects “line” as MOBI and hardcover simultaneously (but as separate items, sadly). I have Ronin, In Her Majesty’s Name, The World on Fire, Dux Bellorum in my Kindle App and will get more, even if I never buy the miniatures to support the game. Why not? It’s cheap and a fun read. Tomorrow’s War (and I presume their other games being published for Ambush Alley) is available as a higher end PDF, with all the great artwork intact. Just as an aside, I have SEEN the Fields of Glory series as PDFs from time to time here and there, but I get the impression this is illegal from a scan and torrent approach, so I have stayed away from it. 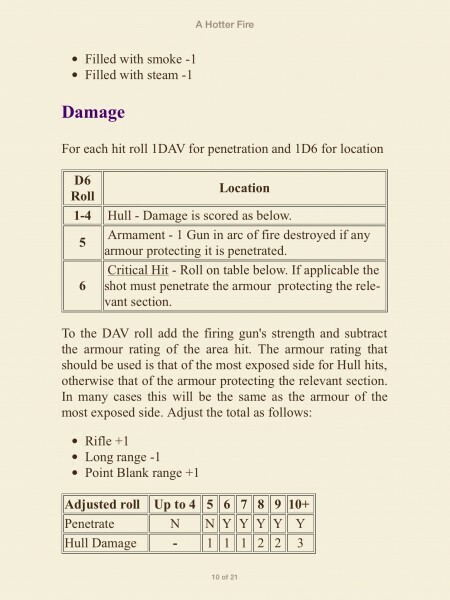 Ditto on files from Warlord Games and Tomahawk Studio.. I’ve seen references to PDFs floating around, but I get the impression it’s illegal, so have avoided it. Two Fat Lardies pretty much offers up everything they do as a PDF download for a cheaper price. I have Sharp Practice and several other titles and expansions from them in PDF. Wessex Games also offers up pretty much everything they make as a digital product, in this case, PDF. 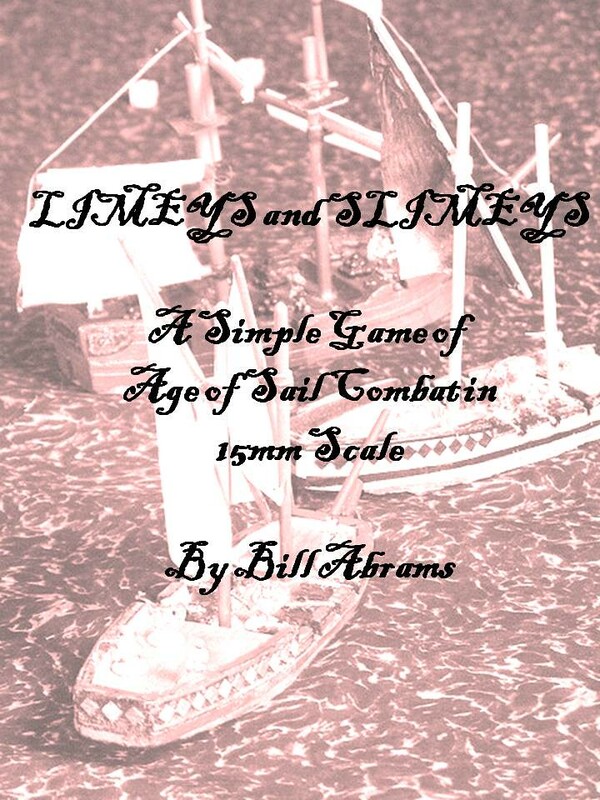 I have their Aeronef and Landships rules– very affordable. Sam Mustafa offers up PDF versions of his rules LASALLE, LONGSTREET, MAURICE and MIGHT AND REASON. All very well received and very affordable as a digital file. Lastly, don’t be afraid to visit the big boys in this hobby– There are plenty of publishers who distribute older or non-supported games (and sometimes even brand new ones) on their websites. 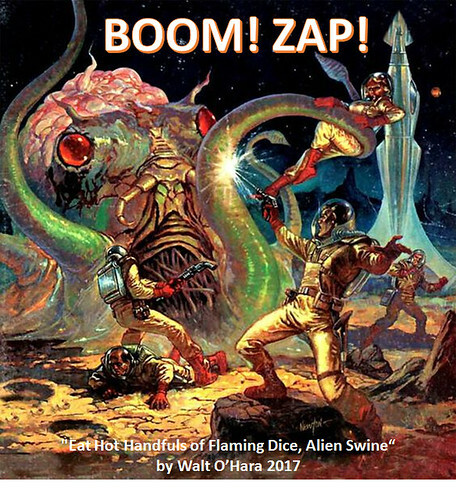 Some of them might surprise you– like Spartan Games, Games Workshop, and GZG, all of whom have older, landmark games available for free download on their websites, usually in PDF Format to retain control of intellectual property and the original formatting. Do you know of a set of commercial rules available in EPUB, PDF or MOBI? Email me. I tried to download white lines of fury, but the link says that the file contains confidential information. is there another way to get a copy?